What is the best way to run Windows on Mac? Is it possible to run Windows 7 on Mac Lion? - Let's find out. Back in 90's when PowerPC platform was introduced for Mac, the world was divided into two , one for Windows users another for Mac users. It was not possible to run Windows on Mac. But, the sean changed when Steve Jobs announced that the Macintosh OS can run on both processors Power PC or Intel, it brought a revolution in bringing Mac and Windows users together. It means that a Mac user can run Windows and other MS applications on his machine. We all love to work with Mac because of it’s advance features and new technology. Suppose you have a Mac machine and want to use an application (compatible on with Windows). Here, it is not feasible to get a new PC to use that application. 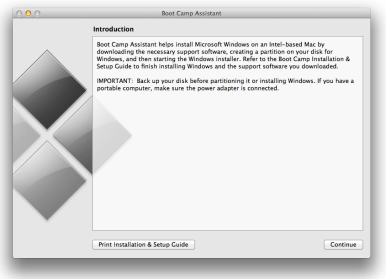 So, it is suggested to install Windows on Mac machine via a Mac utility called Bootcamp. Boot Camp is an inbuilt Mac utility that assists users in installing Microsoft Windows os on Intel-based Macintosh computers. As we all know windows can run over Intel so at first make sure you have an Intel-based Mac: any G4 or G5 Mac will not install Boot Camp. 1. Go to - Applications --> Utilities --> Boot Camp Assistant. Boot camp creates partition in your hard drive to make space for Windows OS. It will reformat the partitions on your existing hard drive with no loss of data. 2. Insert the WinXP installation DVD, wait for it to be recognized by Mac OS, click on Start Installation and wait. When you've finished the Windows XP installation, reboot your system and eject Windows CD. You have almost done. To switch Mac to Windows, every times you need to restart your computer, hold down alt button and select Windows or Mac(options available on the screen) on which you want to work. Boot camp makes easy to enjoy with both OS and there are no chance to any types of data loss in this process. Follow above steps , install both OS and work smoothly and full of enjoyment. How to get rid of rebooting system to switch between Windows and Mac? Here is the technology which replaces the need of rebooting while switching from Mac to Windows or vice versa. This is called virtualization. Virtualization – It is a method of virtualising the Operating system where the kernel of an os allows for multiple isolated user-space instances, instead of just one. The software working with this principle create a "virtual machine" running alongside the Mac operating system. It has the ability to run both Mac OS X and Windows with virtual machine side by side. You can switch between both OS without rebooting your system. Virtualization runs two operating systems simultaneously, but lot of memory space occupied by resources such as memory and processor power in this process. It may be the reason of sluggish performance of Mac. If you have lot of hard drive spaces then you can use virtualization method to run windows and Mac both. It will give you exciting experience.